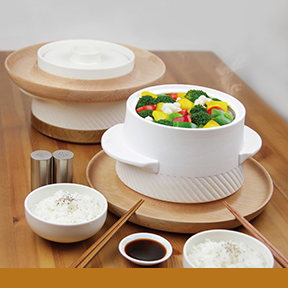 Reunion is the most important concept in Chinese culture, with family and friends especially bonding over meals that offer the “flavor of happiness.” Now, Cocera has produced a casserole pot made from potter’s clay and gravel sand to heighten the eating experience. The pot spreads even and long lasting heat to maintain original taste over time. The package is simple and environment-friendly—pottery products are kilned under 1200℃ without any toxic response; the design is aesthetically pleasing; the function is practical; the price is affordable.